Satan were one of the iconic group of early New Wave of British Heavy Metal (NWOBHM) bands and possessed a name that no doubt did a great deal to endear the metal genre to the so called moral majority! Their 1983 debut album “Court In The Act” is often referred to as one of the pivotal records of the era – perhaps more in hindsight rather than due to its impact at the time. “Cruel Magic” is the band’s third album since reforming in 2011 and it was released on 7th September by Metal Blade Records. The track “Death Knell For A King” was included on the Friday NI Rocks Show on 7th September. Satan formed in Birmingham in 1979 and released a couple of demos and a single before the release of “Court In The Act” in 1983. The band had already been through a few line-up changes prior to that album but the band line-up at that point is the same as the current one. That line-up features Brian Ross on vocals, Steve Ramsay and Russ Tippins on guitars, Graeme English on bass and Sean Taylor on drums. There was a hiatus in the mid 80’s with the band recording as Blind Fury and releasing the album “Out of Reach” in 1985. The change was apparently made to distance themselves from the more extreme metal bands emerging. The Bind Fury album featured Lou Taylor on vocals rather than Brian Ross. Satan went back to their original name for a short time and released their second album “Suspended Sentence” in 1987, with Michael Jackson (not that one!) on vocals. That line-up changed their name again in 1988 with the band becoming Pariah. Under that name they released the albums “Blaze of Obscurity” and “Unity” before disbanding in 1989. There was brief reformation of Pariah in the late 90’s featuring Ramsey, Tippins and English (with Alan Hunter on vocals and Ian McCormack on drums) that released the album “Unity”. 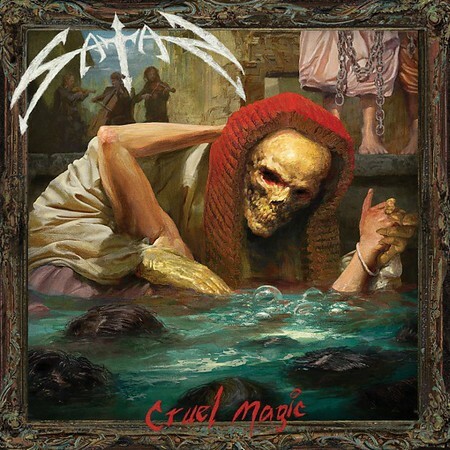 The classic Satan line-up reformed in 2011 and released their third album “Life Sentence” in 2013. That was followed by “Atom By Atom” in 2015. The band has made it quite clear that they don’t just want to live off past glories and that they wanted to release new music that stood on its own merits. With “Cruel Magic” they have definitely achieved that.